Jerry Lewis at last pulls even with one of his heroes – the great Charles Chaplin – as he fulfills all the roles that Charlie used to fill in his movies: writer, director, producer, editor, star. And SILENT. And in the next 70 minutes, Jerry Lewis proceeds to prove it, as he launches from one skit to the next as Stanley the Bellboy, at the busy Fontainebleau Hotel in Miami. Filmed in black and white (I presume for cost – less expensive cameras, no color correction needed, easier lighting, etc. ), the skits are lightning-strike gags, flitting breezily from Stanley setting up chairs in an auditorium, to answering phones, from Stanley walking dogs, to delivering suitcases, and taking a message to Milton Berle (playing himself – and then cameoing as a bellboy! )…Yet the movie leads to a poignant conclusion that sneaks up on us, proving that even if the movie is about nothing, it is not for nothing. 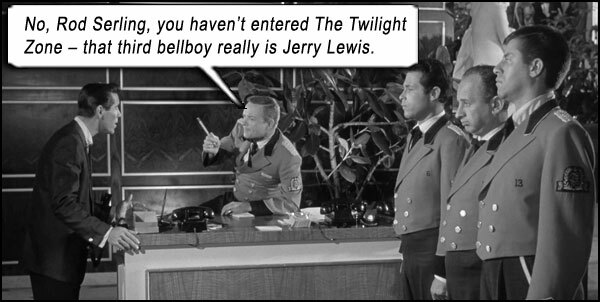 The Bellboy himself never speaks (or gets the opportunity to), so the movie is a showcase for Jerry’s inimitable physical comedy, honed to razor-sharpness in this outing. Consider one bit where we see him in a steady long shot, simply walk across a huge bare ballroom; he varies his gait as he wonders whether to rush or relax; there are no funny/smart lines of dialogue, no slapstick, no nothing, yet this long echoing walk is hilarious. In VISIT TO A SMALL PLANET, though the movie was an artistic failure, his physical shtick was still a standout aspect. 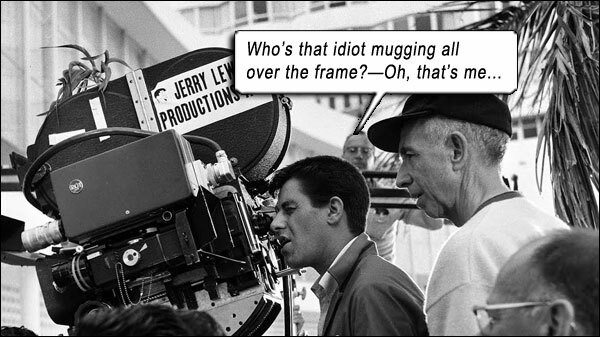 Still, Jerry consulted a ringer in physical comedy – Stan Laurel (of Laurel and Hardy) – for advice on the script. Wikipedia says, “It is unknown if Lewis used any of Laurel’s ideas in the production,” however, Jerry himself has said he used all Stan’s suggestions. And in further homage, named his Bellboy character Stanley! And in further-further homage, Stan Laurel keeps popping up in the film (Laurel lookalike Bill Richmond, who does a great mimicry job, to the point where I used to think it was Laurel himself). This film’s very existence, and how it came about, is amazing: Jerry had his next film, CINDERFELLA, in the can (produced by Jerry, written and directed by Frank Tashlin), and Paramount wanted to release it as a summer movie (June-July in America), while Jerry – exceedingly proud of that product – wanted to save it for a Christmas release. By Jerry’s account, he made a deal with the insistent Paramount in January 1960 to have a completed film for summer release instead of CINDERFELLA. Thus, when he arrived at the Fontainebleau early that year for his scheduled engagement, he called his film crew as well, and THE BELLBOY was created in herks and jerks as Jerry fulfilled his performance contract with the hotel, whilst being allowed to film in and around it when he was not onstage (saving on location scouting, set dressing, production costs, et al). It wasn’t exactly guerrilla, but it wasn’t exactly big-budget studio finesse either. 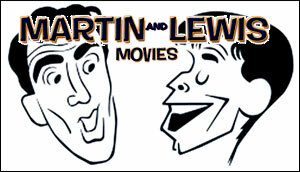 And all of a sudden, Jerry Lewis was now not only the star, writer, producer, et al, but the director as well! No more skulking in the shadows of the guys in berets and megaphones – now he had full onscreen credit as captain of the ship. That’s why the film feels so meta; it is in on its own gag. 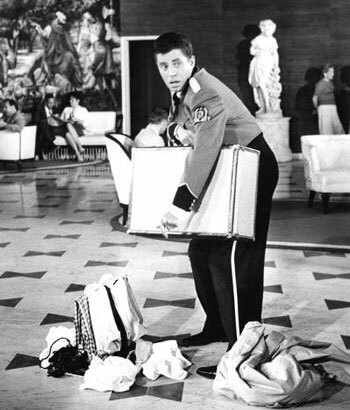 Never more apparent than when Jerry Lewis himself arrives at the Fontainebleau, with a massive retinue, checking into the hotel prior to his engagement, in the film’s funniest segment. As director influences, Jerry cites Frank Tashlin (SON OF PALEFACE, ARTISTS AND MODELS), Norman Taurog (BOYS TOWN, THE STOOGE) and Joseph L. Mankiewicz (THE GHOST AND MRS MUIR, ALL ABOUT EVE) – but now he would surpass them as an influential filmmaker in his own right, by inventing something which no filmmaker these days can do without – a playback monitor. Around this period, Jerry revolutionized the WAY movies were shot by creating what he called the “video assist monitor,” which was simply a video mounted on the camera, recording everything the camera was shooting; after a take, the director and cinematographer could view the take; this process meant the director didn’t have to guess how good the take was, and it also cut down on the number of safety takes. Remember, this was at a time when filmstock had to be sent to a lab to develop before you could view it! The playback monitor seems so obvious now because it is an integral part of filmmaking; like, as integral as a frickin’ camera. But before the King of Comedy invented it, filmmakers were eyeballing and guesstimating through the Golden Age of Hollywood! THE BELLBOY would benefit from this invention, with its speed of production and economy of takes. As was Charlie – into everything. As Charlie’s son Sydney remarks, “If he could have done so, he would have sewn the costumes…” The only thing Charlie Chaplin could really hold over Jerry was the quantity of his written/directed/starring works, otherwise, with THE BELLBOY, Jerry had at last pulled even with one of cinema’s greats. Starring: Jerry Lewis, Alex Gerry, Bob Clayton, Sonnie Sands, Eddie Shaeffer, Herkie Styles, David Landfield, Bill Richmond, Cary Middlecoff, Jack Kruschen.